The inspiration for this edition of MediaETHIOPIA's Photo Essay comes from the unconfirmed reports we had received a week or so ago regarding the 'groundbreaking' of the long overdue Addis Ababa Technology Park. Modeled after similar experiences in India, Nepal, and some Eastern European countries, the talk about this vision of a technology park exclusively dedicated for local and foreign ICT companies goes as far back as 10 years. The last converts - we were told by some of our sources - included Bono (Sir Bono, that is....of the U2 fame) and the soon to be Dr. Meles Zenawi (rumor has it that he is ready to defend his doctoral thesis soon with his draft manuscript still going around town). Sir Bono, we understand, had dropped dealing with the folks that Addis Fortune calls 'Revolutionary Democrats' since last May 05's election. The fate of this proposal, therefore, had been of considerable speculations in town. 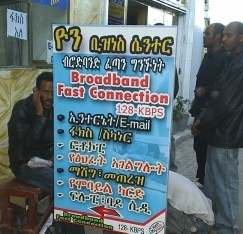 At any rate, as anyone with the faintest interest in ICT in Ethiopia will tell you, the idea is noble and a lot of people have been waiting for this dream to be realized. 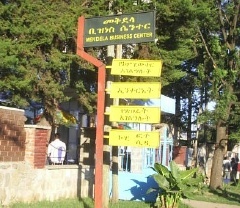 Dreams of Ethiopian software engineers equipped with superfast broadband Internet connections and giving Indian companies a run for their money were floating in our minds as we descended on the large lot by the Bole road we were told the Technology Park was supposed to be. We must report that the story turned out to have got a little bit ahead of the truth. We were, however, not too discouraged as were assured by the same sources later in the day that there is some activity that justifies optimism. In the long tradition of our Photo Essay Team, we called for 'all-hands' meeting on how to rescue this edition - now that Exhibit A was missing. The day being a beautiful Saturday morning, we congregated at one of the city's recent cafes at Haile G/Selassie (Asmara) Road. Most of us were clearly upset wondering why such a fundamental task remains ellusive and unfulfilled. What transpired in this meeting, we thought, was better communicated verbatim unfiltered by the editing/censorship of the MediaETHIOPIA editors. Here are a few samples of the unfiltered conversations. Team Member A: "I have my theory why this project is taking so long. 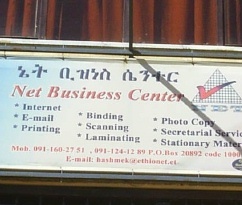 We all know that Meles takes a personal interest in Internet. For example, broadband is down after 10:00 PM as the Prime Minister surfs the Internet, posting articles (with weird pen names like Kebede, Mengew, etc), doing his doctoral research, and chatting with Jeffrey Sachs at Columbia on Google Talk. The bald man is not happy that the Tech Park will gobble up boardband 24/7." Team Member B: "I blame the Chinese. As usual, they are late in getting the web-site monitoring and blog-blocking hardware ready. Even if they get it ready in the next 6 months, they will have difficulty in meshing it with the new CISCO anti-opposition and anti-Kinijit switch/router the government wants deployed in the country." Team Member C: "You guys seem to forget the main stumbling block. 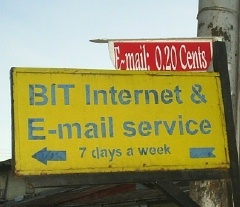 As you know the security people have a very important representation in the ICT Dev. Agency. They demanded 3 buildings at the Tech. Park and the Capacity Building engineers allocated them one of the small ones near the Diesel power generator. I heard the engineer is now planning to hide in the Italian embassy fearing for his life. He speaks Italian - that may help him." 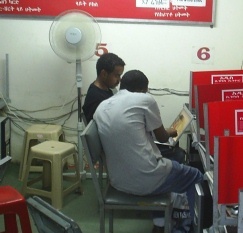 At the end, however, the unanimous decision was that we do a story on Internet Cafes in Addis Ababa. 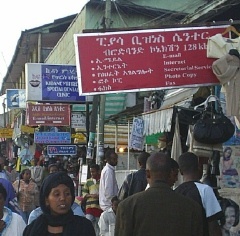 What we found out was that while ETC has less than 20,000 or so Internet account holders (mostly through '19th century' dial-ups), the number of Internet users in Addis Ababa alone is fast climbing to an estimated 100,000. 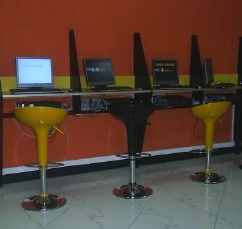 This is exclusively thanks for the Internet Cafes which have mushroomed in the city over the past several years. 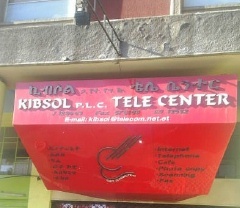 Even Gulele has a number of Internet Cafes and modern 'Business Centers'. 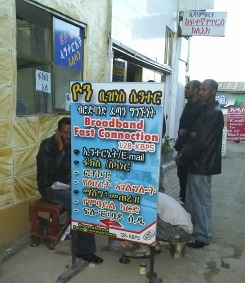 Photos: Shown on scenes from a number of Internet Cafes in Piassa, Gulele, Arat Kilo and Little Magadishu. 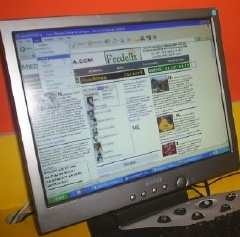 As shown in the photo below, we were delighted to learn that MediaETHIOPIA and a few other 'moderate opposition' sites were unblocked for a few days in May, 2007. We dedicate this edition of Photo Essay to the brave Anthony Mitchell who was in that fateful Kenya Airways flight which crashed in the forests of Cameroon on May 5, 07. Ethiopians lost a great and honest friend. 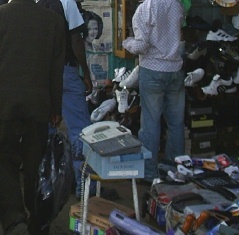 Photo 2 removed [one of the subjects on the photo sent e-mail advising 'ke-memot me-senbet'].